Happy Christmas Roger - I love your card! Happy Christmas to you Poppy. 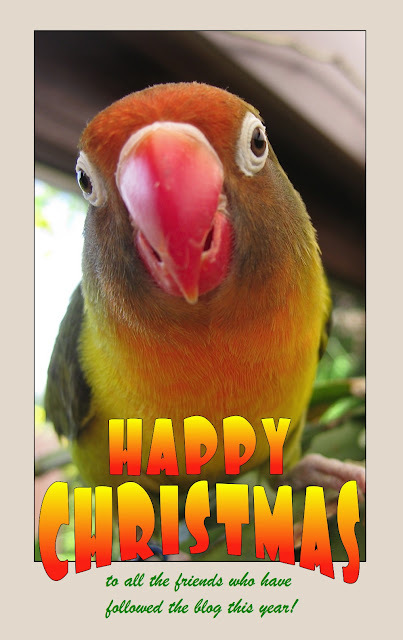 Poppy parrot sends you his special regards! Happy holidays Roger, Brenda and Poppy! Really good card Roger. All the best. That is one mighty good looking bird! Ohhh is this what we should have received ?? I detect this might be a complaint from someone who did not get my Christmas card and letter. I have e-mailed a copy of the Brook annual events to you Harry and Rowena. I have mentioned on todays post Lancashire college where you Rowena was our horticultural secretary!